G 125 is an innovative wooden swivel chair by Girsberger to mark the company's 125th anniversary. 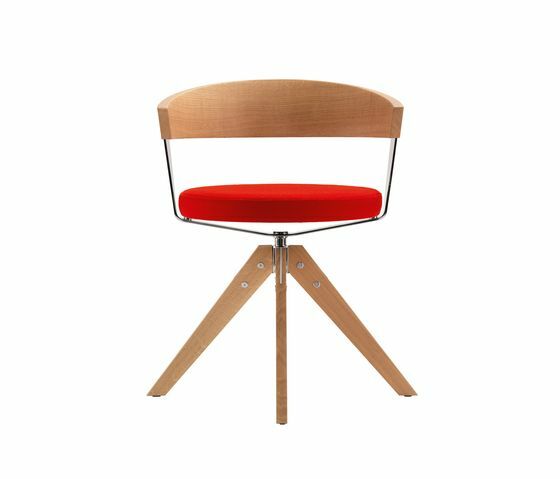 It evokes the early days when Girsberger made a name for itself as a specialist for chairs and height-adjustable piano stools. The chair was designed by Mathias Seiler. Girsberger started out as a woodworking shop that produced a number of wooden items. In 1907, Heinrich Girsberger applied to patent the infinite height adjustment feature of the Modell 111. Thus began Girsberger's reputation as a chair specialist. The first office swivel chairs made of solid wood soon followed. Girsberger continued producing this type of chair in pioneering fashion until the 1950s. Today, the wooden swivel chairs have disappeared from the market. Mathias Seiler, Head of Design and Marketing at Girsberger, came up with the idea of relaunching the wooden swivel chair in a modern design. The key element is simplicity – the chair has just a few functions and options for adjustment. It is thus a counterweight to modern swivel chairs, whose functions and options are being continuously expanded, but which appeal less and less to our senses. And – just like the first Girsberger piano stool – the G 125 also features intelligent technology. It has a U-shaped seat and backrest made of tempered steel, which functions as a flexible torsion rod and allows the seat and back to rock comfortably – without any sophisticated tilting mechanism or other technical elements. The G 125 comes with either wooden feet or steel feet on castors. The seat is made of either an upholstered seat board or a moulded wooden ring with transparent mesh covering. The backrest is made of steam-moulded solid wood. The G 125 is made entirely of natural materials – apart from the castors. The chair is made almost entirely at the Bützberg factory in Switzerland. Girsberger is able to do this, as the plant still covers a high percentage of the production work. This is another conscious difference to other swivel chairs: there is hardly any other manufacturer in Europe that still produces its own swivel chairs. Usually, the components are sourced from specialist suppliers and only assembled in the workshop. With its G 125 materials and production concept, Girsberger is sending out a signal in favour of high-value, sustainable materials and also promoting its own production facility in Bützberg.